Youth Movement is a sponsored event through the College of Education and has been around for seven years (previously sponsored through the Warsaw Sports Business Club). Our mission is to ignite a generation to be active, motivated, and connected to the power of community. 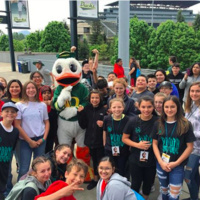 We are achieving this mission by hosting a field day with stations about exercise and nutrition for Native American middle school students from Oregon and Southern Washington.